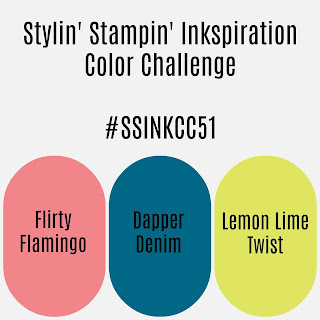 We have a fun color challenge to share with you today at Stylin’ Stampin’ INKspiration: Flirty Flamingo, Dapper Denim, & Lemon Lime Twist. I think these colors are so pretty together. And the thing I’m most excited about: Flirty Flamingo, now an In Color, is coming back TO STAY with the color revamp!! Yay! I was inspired after seeing a pretty card on Instagram with a watercolor background & the mermaid on top. I don’t seem to be able to copy the picture from Instagram (can you do that? ), but I can tell you where to find this talented lady on Instagram… chandrajunck888. I think the secret is starting with watercolor paper! Makes such a difference. I put a few drops of ink on my clear block, then painted with my aquapainter, mixing the colors a bit. I just received my preorder from the 2018-2019 Annual Catalog. The Nature’s Poem Suite is my absolute favorite!!! Trees, branches, leaves- with thinlits!! It’s Lovely as a Tree on steroids! The copper adds a nice accent, don’t you think? You’ll find my supply list on the bottom of this post (except for the Rooted in Nature Bundle that will be available for purchase June 1st. Unless you’re a demo, then you can order it now! Don’t forget my May Promo… make a $50 order from me on line & I’ll send you a package of leaves trinkets as a Thank You! Be sure & check out the SSINK Page to see what the other designers did using these pretty colors! Better yet, add your own card to the challenge! We’d love to see what you come up with!